Around 2002, a new backyard villain made its way to Ontario. 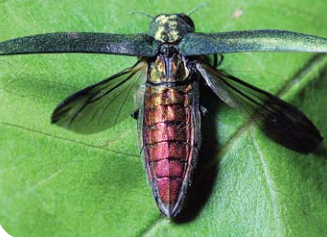 Starting from a home population in Michigan, this scourge of majestic ash trees invaded Windsor, spread to the London area, and now can be found as far north as Sault Ste. Marie. In little more than a decade and a half, it’s become an invasive species as infamous as the zebra mussel, the Asian carp, and the giant hogweed. Tree trimming isn’t as simple as taking a pair of pruning shears and cutting off branches whenever it’s convenient for you and the tree. Tree trimming means knowing all about trees: how they grow, what shape it’s going to take after the trimming, and how to control that shape. Trimming and pruning are all about controlling the tree and ensuring its beauty, health, and your safety are all protected. Tree trimming? Yes, it IS necessary. Unless you operate an orchard, you might think the trees on your property don’t need your help. They grew to towering heights without your help, so there’s no need to take care of them, right? Not true! A tree might be a living thing that grew without your help, but it will definitely need your help to stay healthy and grow properly. A good tree trimming not only has aesthetic benefits – it can benefit your tree and your safety, too. How Do Deciduous Trees Survive Winter?